Summer is a great time of year for an abundance of seasonal fruit, and right now there are plenty of berries in season. Choosing seasonally is an excellent way to get great tasting produce at a good price. 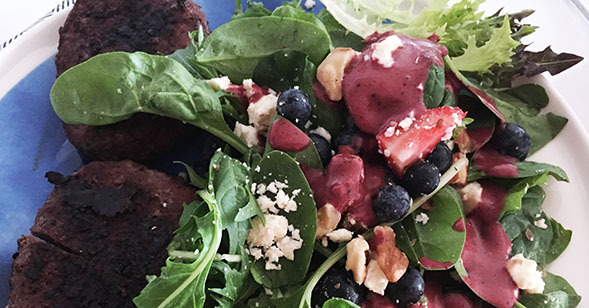 Below is a salad recipe that incorporates my love of berries. It’s a refreshing salad that is great for hot summer days and also an easy dish to make to take to BBQs. Yum! Place all salad ingredients in to a large bowl and mix together. Add all dressing ingredients in to a blender/bullet and blend together until liquid. Place dressing in to a jug for people to add to their own salad.